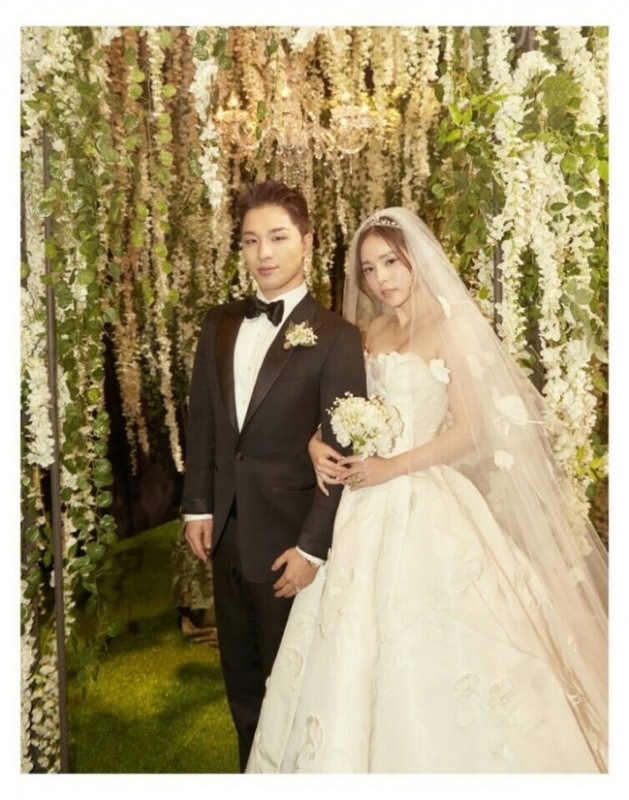 Boy band Big Bang’s Taeyang and his actress fiancee Min Hyo-rin tied the knot in a church on Saturday, the singer’s agency said. YG Entertainment said the closed-door wedding was held at a church in Anyang, south of Seoul, at 3 p.m., with singer Zion.T singing a congratulatory song. Only a small number of their family members and acquaintances, including YG Entertainment CEO Yang Hyun-suk, attended the wedding, while a number of their Korean and foreign fans gathered outside. The couple is to hold a wedding party at the Paradise City hotel in Incheon, west of Seoul, Saturday evening, the agency said. The two have been seeing each other since 2014 and made it public in June 2015. Taeyang called Min “the muse who inspires me” when he dismissed a breakup rumor last August. Min, 31, made her debut in 2006 as a commercial model and has starred in movies such as “Sunny” in 2011 and “The Grand Heist” in 2012.